Organizations are trying to increase their internal speed and flexibility by shedding current bureaucratic governance models and structures. These organizations are looking at Agile as a potential “answer” to becoming faster and flexible. Agile principles have proven effective for software development at a team level, but can they do the same at the organizational level? How do you scale agile principles and practices across the enterprise? 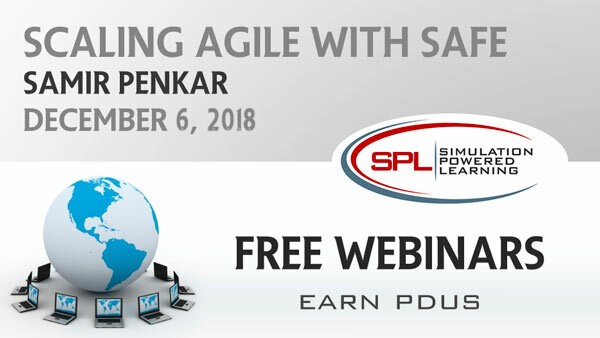 In this webinar we will introduce Scaled Agile Framework – SAFe and attempt to answer these questions. In the pursuit of enterprise agility, Scaled Agile Framework (SAFe) offers a framework that you can customize for your organization. Introduce the Scaled Agile Framework – SAFe – what is it? Share a few key scaling agile concepts. Look at some case studies of companies who have successfully applied SAFe. Samir Penkar, SAFe SPC, CSM, PMP, Product Owner. As an avid evangelist for agile practices, Samir Penkar attended the first SAFe 4.0 training program led by SAFe founder Dean Leffingwell. He has more than a decade of experience in program and project management leading and running agile initiatives. Samir is the author of the program management book From Projects to Programs. He has been featured in The Wall Street Journal, Fox9 News and has presented on project management topics throughout the world.